Species are obviously enormously variable in their characteristics and this variation can be expected to influence the impact of climate change on them. Despite this, there have been only a few explicit comparisons of climate change impacts over a broad range of species. It still isn’t clear whether some kinds of organisms are affected by climate change more than others. But this clearly has consequences for how community compositions might change in the future. The effect of climate change on population abundances are less studied than those on species ranges. This is partly because population abundance data are harder to come by. Nonetheless, abundance is an interesting variable to study. Because a species may change in abundance before changing in range, we may detect differences in abundance trends among species that aren’t apparent if we just look at range edges. Based on these ideas, the aim of our study was to study the impacts of climate change on population abundances, using as much data, from as many different species, as we could get our hands on. The project was initiated at the Senckenberg Biodiversity and Climate Research Centre, which conveniently has a number of on-going long-term population data projects. These data were the first contributions to our project. We then searched for other data that could be suitable (long-term [not necessarily annual] population data for a community since 1980) and invited others to join. Basically we (or rather I) pestered a lot of people. Surprisingly, this approach was successful and a nice network of data owners was formed. Although we haven’t (yet!) been able to get everyone in the same room, we organised a symposium on long-term monitoring at our institute, which many of the data owners attended. To increase the chance of the project ending, and also reduce complications associated with different patterns of climate change among different data sets, we limited ourselves to population data collected within a vague geographic scope of Germany and neighbouring countries (plus the North Sea). In the end, we had 22 community data sets (10 terrestrial, and 6 marine/freshwater) that gave over 1000 population time-series from algae to mammals (Fig. 1 a and b for example datasets). These data were collected mostly as scientific studies, but also came from government agencies and citizen science. Figure 1a: Sorting benthic fauna hauled from the Dogger Bank in the North Sea – this time series had been collected almost every summer between 1991 and 2012 - photo from Moritz Sonnewald, taken by Sven Tränkner. 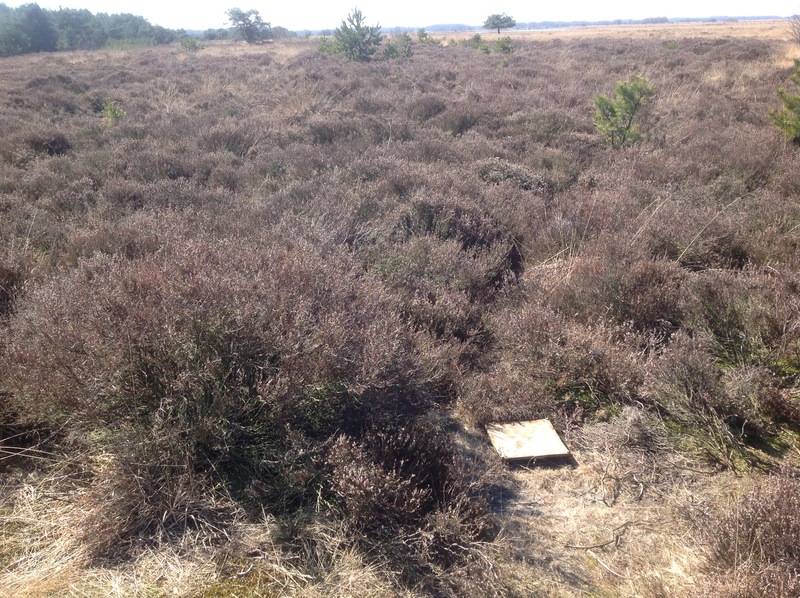 Figure 1b: A pitfall trap of the series AY (bottow right), placed in 1959 by population ecologist Piet den Boer at the heathlands of the Dwingelderveld (the Netherlands). The traps are still in function and ground beetles up till now collected here weekly for almost 60 years – photo from Rikjan Vermeulen. Our test was based on the prediction that warm-adapted species should increase (or decrease less) than cold-adapted ones within each community under climate change (Fig. 2). 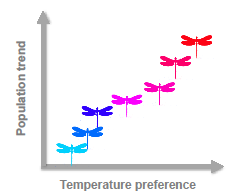 Figure 2: Hypothesized relationship between species’ temperature preferences and their population trends under climate change. Following this, we regarded the strength of the relationship between species’ temperature preferences and their population trends as a measure of the impact of climate change. We used the population data to estimate species’ population trends and compiled distribution data to estimate species’ temperature preferences. We then tested this relationship for each of the 22 community data sets. Our analysis first established whether species’ abundance had shown some directional change since 1980. We found a mixture of trends (c. 50% significant trends) in almost all datasets: many species have decreased, but many species have also increased. This suggested that the communities had been exposed to some persistent, long-term driver of change causing long-term changes in abundance. Consistent with climate change impacts, the variation in population trends was partly explainable by species’ temperature preferences within the terrestrial communities. On average, temperature preference was positively related to population trends. Although some of the cold-adapted species had decreased, more commonly warm-adapted species had increased (Fig. 3). We found weaker relationships in the marine and freshwater datasets although warm-dwelling marine fish have increased. 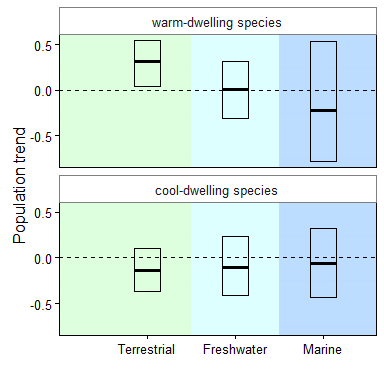 Figure 3: Average population trends (converted into a correlation coefficient) of species in the upper and lower quartiles of temperature preferences, i.e., warm and cool-dwelling species for terrestrial, freshwater and marine species. We also took the same approach to examine the effects of other drivers and species attributes, making use of the growing number of species information databases (not only GBIF and OBIS, but also: freshwaterecology.info, fishbase, edaphobase, carabirds.org, CLIMBER, marLIN among others). With this further analysis, we found, for instance, that population trends could be related to species’ nutrient preferences in the freshwater datasets, with more positive trends of species preferring lower nutrients. This findings suggested an effect of improved water quality, probably due to better waste water treatment that has happened in many places in Europe. Attributing changes in species’ abundance to a particular driver is tricky because populations are exposed to many drivers at the same time. By relating population trends to species characteristics (temperature preferences), we show how it is possible to detect the particular effects of climate change on species’ abundances. Our results suggest that climate change impacts are not just detectable at species’ range edges, but potentially elsewhere within species’ ranges, on their population sizes. Within the terrestrial realm, very different organisms, including mobile organisms like birds, but also slow-organisms like lichen, are being affected. There does not appear to be a simple characteristic associated with how much an organism is affected by climate change – impacts of climate change are seemingly widespread across species. Ecology often tends to separate marine, and freshwater, and terrestrial research – in journals, in conference schedules, in analytical methods, in actual ecology….?? Bringing together ecologists studying different ecosystems and environmental realms has the potential to generate new and interesting discussion about the impacts of climate change. Hopefully my co-authors agree!